Virtually all thermoplastics can be supplied as sheet and vacuum formed. The more commonly used materials are listed below. Vacuum forming offers several processing advantages over other forming processes. Low forming pressures are used thus enabling comparatively low cost tooling. More sophisticated machines and moulds are used for continuous automated production of high volume items like yoghurt pots, disposable cups and sandwich packs. The clamp frame needs to be sufficiently powerful enough to ensure the plastic sheet is firmly held during the forming process. It can handle the thickest material likely to be formed on the machine – up to 6mm with a single heater and up to 10mm with the twin heater machines. If an automated process is used the operation of the moving parts must be guarded and interlocked to avoid accidental damage. In addition, a safety guard must be provided to protect the machine operator at all times. Heaters are generally infra-red elements mounted within an aluminum reflector plate. In order to obtain the best vacuum forming results, using any material, it is essential that the sheet is heated uniformly over its entire surface area and throughout its thickness. In order to achieve this, it is necessary to have a series of zones that are controlled by energy regulators. Ceramics do have some disadvantage in that their high thermal mass makes them slow to warm up (approx 15 minutes) and slow in their response time when adjustments are made. More sophisticated quartz heaters are available which have less thermal mass enabling more rapid response time. Pyrometers enable accurate heat temperature control by sensing the melting temperature of the sheet and interacting with the operating process control. Precise temperature readout is also available with a computer controlled system working in unison with the pyrometers. Twin heaters are also recommended when forming thicker materials as they assist in providing more uniform heat penetration and faster cycle times. Twin quartz heaters are advisable when forming high temperature materials with critical forming temperatures. By close control of areas of heat intensity, heat losses around the edges caused by convection air currents and absorption from clamp areas can be fully compensated for and consistent results achieved on a continuous basis. Cost savings can also be considerable if quartz heaters are specified, as there is an adjustable percentage power drop when the heaters are in the rear position during the forming process. A photo-electric beam is incorporated in the machine to scan between the bottom heater and the sheet of plastic. If the sheet of plastic sags down and breaks the beam, then a small amount of air is injected into the bottom chamber, thus lifting the sheet to stop it from sagging. Once the plastic has reached its forming temperature or “plastic” state it can be pre-stretched to ensure even wall thickness when the vacuum is applied. The method of controlling the bubble height should be that consistent results are obtainable. Vacuum, air pressure, and optional aids such as a plug assist are then used to assist in moulding the heated, stretched plastic. Plug assisted vacuum forming (moulding) is used when straight vacuum forming is unable to distribute the thermoplastic sheet evenly to all areas of the mold. To help spread the sheet out more evenly, a device known as a plug is utilized to push the sheet into the mold before the vacuum is applied. This process enables more of the thermoplastic material to reach the bottom of the mold and thus more material is available to fill the corners of the mould and limit the plastic from thinning out. Once the material is suitably pre-stretched a vacuum can be applied to assist in forming the sheet. A dry vane vacuum pump is used to draw the air trapped between the sheet and the mould. The vacuum pump should be capable of maintaining a differential pressure of approximately 27” mercury. With larger machines a vacuum reservoir is used in conjunction with a high volume capacity vacuum pump. 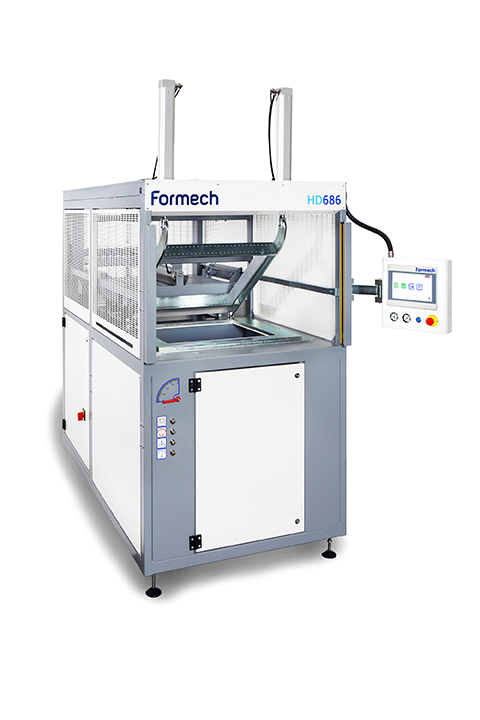 This enables a two stages vacuum to be applied ensuring rapid moulding of the heated sheet (before the sheet temperature drops below its ideal forming temperature). Once formed, the plastic must be allowed to cool before being released. If released too soon then deformation of the moulding will result in a reject part. To speed up the cooling cycle high speed, fans are fitted and activated once the part is formed. A spray mist option is also available whereby nozzles are attached to the fans and a fine mist of chilled water is directed onto the sheet. This, in conjunction with the fans can speed up the cooling cycle by up to 30%. Mould temperature control units are also available which regulate the temperature within the mould ensuring accurate and consistent cooling times when cooling crystalline and crystallizing polymers such as PP, HDPE and PET. Once the formed part has cooled and been removed from the machine the excess material is removed. Holes, slots and cut-outs are then drilled into the part. Other post-forming processes include decoration, printing, strengthening, reinforcing and assembly. A variety of different trimming methods are used to trim the product from the sheet. The type of equipment best suited depends largely on the type of cut, size of the part, draw ratio, thickness of material and the production quantity required. Thin gauge parts are normally trimmed on a mechanical trim press - otherwise known as a rollerpress.